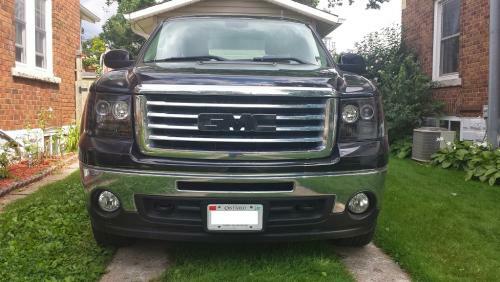 I even think it looks like a chiseled GMT-900 with the squared off top corners and square grille. Front is very flat/vertical, great sharp angles. The only critique I would have are the change signals. They look to be attached to each other with a bar that goes around the grille. Looks like a mustache almost, it bothers me. I think the AT4 looks great. The Silverado 2500 isn't nice in my opinion. GM is slow to design and implement options for their vehicles but I love how reliable their vehicles are. Ford has fancy stuff, Dodge has fancy stuff but I always hear those owners complain about reliability. Personally I think the big 3 are very close when looking at their entire packages. At the end of the day it comes down to what you like. I am very excited about this engine option though I'm holding my breath. I want to see those towing numbers first. Madcaddie, How much would you say your trailer weighs when loaded? You also have the 6.2L? I'm also looking at the AT4 from a 2010 All Terrain. Don't the new Tahoe/Suburbans offer larger sunroofs? I could see it being an option in the future. I'd never get one due to the leak factor but they do look cool and should be an option. Especially when your competitors offer that option. Ok thanks for the clarification. I too would like a hybrid as long as it could pull my boat which is approximately 5000 lbs loaded. Which wouldn't be too much to ask. A question to make everyone's eyes roll...Do you think a hybrid engine option will be available? Didn't GM state there would be six engine options? So 5.3, 6.2, Deisel....what would the other options be? Has anyone heard anything else about today's second reveal of the 2019 Sierra? What about a diesel hybrid? I'd probably grab one of those for sure! I hope the 1500's get a diesel like the Ram has. I don't need a 2500 but would love a diesel truck. Good to hear, a nice relief!